What is Foundation Bolting / House Bolting? Foundation bolting (house bolting), is a process of attaching a house to its concrete foundation. The up-and-down and side-to-side motion of an earthquake can shake an unbolted house off its foundation. Avalin Seismic Construction Co. has specialized in foundation bolting projects in the greater Los Angeles area since 1991. The figure on the left shows foundatin bolts that were installed at the time of the original construction. 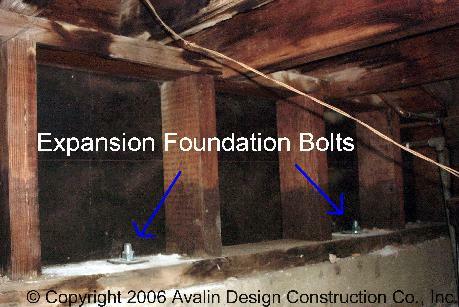 The figure on the right shows foundation bolting plates that were added as a foundation bolting retrofit. During the 1994 Northridge earthquake, thousands of unbolted homes were damaged or destroyed. Foundation bolting, also known as house bolting, is easy, quick and inexpensive and provides greater protection against the forces of earthquakes. We use a combination of expansion wedge anchors and epoxied threaded rods to bolt a house to its foundation. Typically, these bolts are spaced 5' or less apart for a one story house and 4' or less apart for a two story house. Side bolting is used if the crawl space does not allow for direct bolting. Click here to see more photos of foundation bolting. Call us now: (877)265-8872 or Contact us via email. © Copyright Avalin Design Construction Co., Inc. All rights reserved.